The United States relies heavily on commercial vehicles to transport goods every day. And because of its location in the heart of the country, and its close proximity to rivers, railroads, airports, and interstate highways, Illinois has long been an epicenter of commercial transportation, with millions of tons of freight moving through the state with the help of commercial vehicles of all types, including large trucks, semi-trailers, and buses. While such large commercial vehicles help companies bring their products across the country more efficiently, their sheer magnitude can make even a simple “fender-bender” extremely dangerous. Large trucks are 40 or more times heavier than the average vehicle on the road. When a semi-trailer collides with a small car, even at relatively low speeds, the injuries can be extreme, including broken bones, amputation of limbs, brain damage, paralysis, and sometimes death. Someone who has been hit by a commercial vehicle could find themselves stuck with catastrophic medical bills, often made much worse by the loss of income than can accompany serious injury. 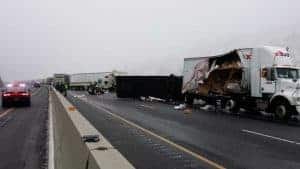 In the wake of such life-changing events, people who have been hit by a commercial vehicle, and their families, often turn to the assistance of the commercial vehicle accident attorneys at GWC Law. With over $2 billion recovered for our clients, GWC has a proven track record of success representing individuals and their families all over Illinois who have been devastated by the serious injuries and death that come from being hit by a commercial vehicle. Aside from the large sizes that make collisions that much worse, commercial vehicles have a number of distinguishing features that could increase the likelihood of accidents. Commercial vehicles are usually either owned or commissioned by large corporations. Because these corporations are focused on maximizing profits, there is an incentive to delay necessary maintenance in order to keep these vehicles on the road as much as possible. Similarly, commercial vehicle operators are routinely encouraged to drive more and more miles for longer and longer hours each shift. When you combine these elements, what is the result? Fatigued drivers traveling at excessive rates of speed in enormous vehicles that may have a higher-than-average rate of malfunction because they have not been properly serviced. That is a recipe for disaster for everyone else on the road. Given the various factors that can make collisions with commercial vehicles both more dangerous and more likely, they are required to carry larger insurance coverage to compensate those whom they injure. But to be sure that you can take full advantage of the coverage available when you are hit by a commercial vehicle, you first identify it as a commercial vehicle – and it is not always as obvious as you think. The term “commercial vehicle” can be applied to small passenger vehicles as well as semi-trailers, large trucks, and buses, provided that the vehicle is owned by a company and/or used for commercial purposes. Sometimes, even if a passenger vehicle is privately owned and operated by a company employee, the driver’s employer and its commercial insurance coverage might still be financially liable for any accident in which the vehicle was involved, provided that the vehicle was being used for work-related purposes. For this reason, it is crucial that you always inquire about the employment status of any driver, because if he or she was working when the vehicle struck you, the collision may qualify as a commercial vehicle accident. Outside of the driver and his or her employer, there may still be other parties involved when you have been hit by a commercial vehicle. For example, in most cases, the commercial transport company has likely been hired by another company to carry its goods, and even that company could have been contracted by yet another company. It is therefore essential that all parties who are potentially at fault be identified and pursued within the time limited by law. Failure to do so could forever bar you from obtaining the justice that you deserve. With so many parties facing so much potential financial exposure in a commercial vehicle accident, you can be sure that the large insurance companies representing them are incentivized to fight you every step of the way in order to minimize the amount of compensation you receive. And when multi-billion-dollar corporations fight you, it is important to have somebody on your side to fight back, like the commercial vehicle accident attorneys at GWC Law. If you have been hit by a commercial vehicle, contact GWC to schedule a zero-cost, zero-obligation consultation with one of our attorneys. Call us at (312) 999-9999 or click here to chat with a representative at any time. Remember, you won’t pay anything until we make them pay you! Contact GWC Law for a zero-cost, zero-obligation consultation with one of our attorneys right now. And remember, at GWC, we don’t get paid unless and until YOU get paid! A male driver suffered a fatal accident as a result of a semi-truck driver swerving his truck into westbound traffic and striking head-on the car of the victim.